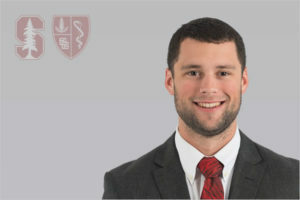 Michael joined Stanford Sports Medicine in the Summer of 2016 as an intern certified athletic trainer to provide direct medical care to the Football and the Synchronized Swimming teams. Michael was then hired as a full-time assistant athletic trainer in the summer of 2017. He assists with the Athletic Training and Sports Medicine program in Stanford University by helping supervise and give direction to the certified and student athletic training interns. Prior to his arrival at Stanford, Michael was an undergraduate student at Colby-Sawyer College in New London, NH. He graduated with a Bachelor of Science in Athletic Training in May 2016. While in undergrad, Michael had internships at various locations including with the Colby-Sawyer’s baseball and men’s soccer teams, Dartmouth College’s rugby teams, Stevens High School, and with Stanford University during the fall preseason football camp in 2015. Born in West Springfield, Massachusetts, Michael is an avid proponent of athletics and living an active lifestyle. He enjoyed snowboarding and playing rugby while in New Hampshire. Michael resides in East Palo Alto. Michael enjoys traveling and spending time outdoors with friends.